Local and Fresh…. We pride ourselves on sourcing locally produced meats as well as delicious Aberdeen Angus & much more! As the Game season is upon us, we can source a wide selection to suit all tastes from our local Game Dealer. Have you tried our tasty home-made Pies…. 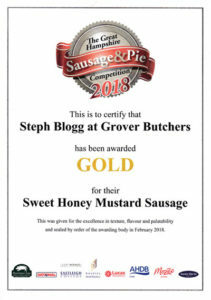 all made by hand with the quality meat you would expect from Grover Butchers…… it’s a must, just pop in and choose any of our delicious filling options. Either ready cooked or frozen, the choice is yours! We produce by hand our very own Biltong, Boerewors and Droewors… a totally delicious South African snack! 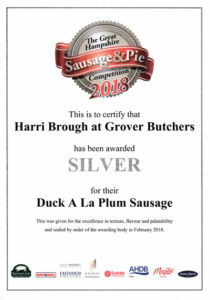 We offer our customers quality meats together with experienced service and advice, so visit our shops and take a look at the tempting selection…Grover Butchers…. here to help! 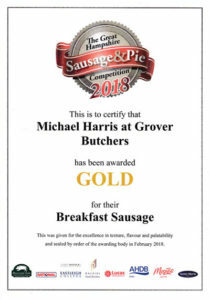 We are very proud and a massive well done to all our staff to have received Gold and Silver Awards again in 2018… all our sausages are hand made by us …... come in and try some soon!! 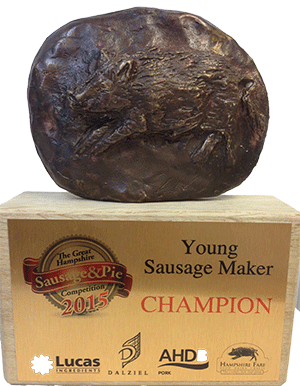 Come in and meet our team and try our AWARD WINNING SAUSAGES…….delicious!! 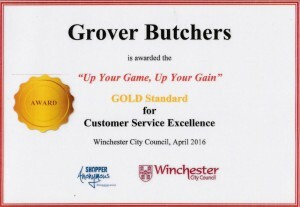 Great news for Grover’s… we are very proud to announce that we have been awarded Gold Standard for Customer Service Excellence. We pride ourselves in providing great meat at great prices whilst building great customer rapport, thank you to all our customers for your support and we look forward to seeing you soon!